Rethink Autism, Inc. of New York, New York, USA won a Stevie® Award for Best Website - Health Products & Services in the website awards categories of The 2011 American Business Awards, the premiere business awards program in the U.S.A. (The 2012 ABAs are accepting entries. Request your entry kit here and submit by the April 25 final entry deadline.) Here we look at Rethink Autism’s award-winning online services. An online professional support system. Rethink Autism uses a variety of techniques that allow users to easily navigate the site, connect with others, and find desired information. Read Rethink Autism's winning entry and check out the award winning website here. Launched in 2009, Rethink Autism is an online website service that provides clinical best practice autism treatment programs worldwide. Rethink Autism's online services provide training to families and teachers for implementing treatment, tools for evaluating needs of the students and tracking their progress, a complete video-based curriculum with over 1,200 teaching steps, and an online professional networking support system. Rethink Autism is based in New York City and has 10 employees. We've just updated our 10 Tips for Winning Web Awards in the Stevie® Awards tipsheet for 2012! Get it here. Let us help you get the most out of your Stevie® Awards web awards submissions: Download our 10 Tips for Winning Web Awards in the Stevie Awards tipsheet. View all of the possible website award categories. Web awards include categories for recognition of IT professionals, as well as categories dedicated to exceptional web sites, blogs, videos and other produced tools. Get an introduction to our new app awards for smartphones and tablets. Submit entries for your organization's latest app (issued or updated since January 1, 2011). Increase your chances of winning a Stevie Award! Get insider tricks to help you choose the best web award categories for your organization. 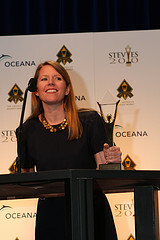 Which website, blog, video, or application will you be submitting for the 2012 Stevie Awards? Once a month in this space we bring to your attention several apps, web sites and blogs that we think will help to make your work day a bit more productive and enjoyable. Here are this month's recommendations. This Is My Next: A temporary home for former Engadget writers who are launching a new online publication in September. DeepMarket: Up-to-the-minute information on U.S. stock markets. American Express Open App Center: American Express® OPEN, winner of multiple Stevie Awards in The 2011 American Business Awards, has created App Center specifically with businesses in mind. It offers digital tools that can help you manage cash flow, save time and money, and grow customer relationships. News360: Created by a small company dedicated to changing the world of news, News360 wants people to be better informed and find things out faster. Available for iPhone, iPad, Android, Windows Phone, BlackBerry PlayBook. Free. Looking for recognition for your app or site? Learn how to win a Stevie Award for your work - get our free tipsheet now. We've just published a new tipsheet called 10 Tips for Winning Web Awards in the 2011 Stevie Awards. Get it here. It summarizes the 10 best ways to get recognized for your web site, blog, or creative work in the four Stevie Awards competitions in 2011 (which include The American Business Awards, The International Business Awards, the Stevie Awards for Women in Business, and the Stevie Awards for Sales & Customer Service). For the most part it recommends the web site and blog awards, interactive multimedia awards, and other categories that web folks should focus on, and outlines the general submission requirements for those categories. Elite Editing is a New York–based full-service editorial company, offering proofreading, editing and writing help for businesses, academics and individuals through the website EliteEditing.com. The company earned one of the website awards in the 2010 Stevie Awards for Women in Business, the global competition for women entrepreneurs, executives, and the organizations they run. 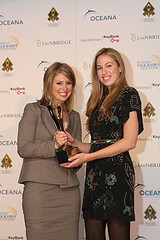 Company owner Jennifer Rotner accepted the Stevie at the awards dinner in New York on Friday, November 12 2010. See her acceptance speech here. EliteEditing.com allows users to upload documents and pay instantly so that, no matter the deadline, their work will be delivered on time and error-free. The site also functions as an extensive writing resource, offering an invaluable list of articles, links and writing tips that is constantly evolving, with new, original content added daily. The next opportunities to win web awards and blog awards from the Stevies include the website and blog awards categories of The 2011 American Business Awards, and the web awards categories of The 2011 International Business Awards.